Tile Cleaning At It's Best! The tile cleaning, natural stone cleaning and carpet cleaning professionals at Sierra Tile, Stone and Carpet Care are truly one of the best in the floor care business. I won't just clean your tile and grout, natural stone or carpet. I will bring new life to it...GUARANTEED!!! Let Sierra Tile, Stone and Carpet Care, your premier tile, natural stone and carpet care specialist take care of your tile cleaning, travertine cleaning and carpet cleaning needs for you. 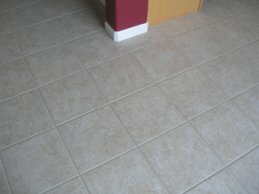 Whether its restoring your travertine tile floors, cleaning your tile and grout or steam cleaning the carpet in your home, Sierra Tile, Stone and Carpet Care serving El Dorado Hills, Folsom, Cameron Park, Sacramento, Placerville, Roseville, Granite Bay, Rancho Murieta, and surrounding areas, can do it all. At Serra Tile, Stone and Carpet Care we specialize in your tile and grout cleaning needs. Professional travertine cleaning and sealing in Folsom, El Dorado Hills, Sacramento and surrounding areas. Sealing grout with a premium sealer is the only way to protect it from a water or oil-based stain. 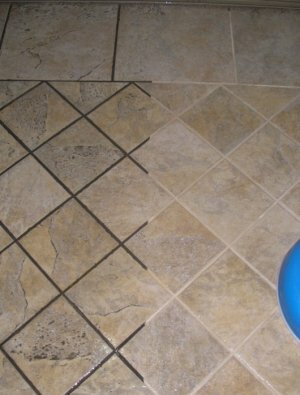 That dirty grout in your tile floors can be a real eye sore. Years worth of packed in grease and food stains in your kitchen counters and floors, dirty grout lines in your dining and family room floors, soil build up in your entry tile and let's not forget the dreaded mildew stains in your shower walls. And worse of all, cleaning all of that stained and dirty grout can be impossible for a homeowner to do when utilizing traditional tile cleaning methods. My powerful truck mounted cleaning system will surgically remove years worth of built up dirt, grime and germs returning your tile and grout to a like-new condition, without the need to regrout, saving you valuable time and money. After which, if requested, I can help protect your newly cleaned tile and grout or natural stone surfaces from any future stains with my clear seal or color seal process. This will help maintain the natural beauty of your tile and grout for years to come. So, if your tired of looking at those dirty grout lines in your tile or dirty traffic lanes in your carpet, and you want the job done right, don't trust just any cleaning company. Trust me... Owner/operator of Sierra Tile, Stone and Carpet Care. Your local tile cleaning (and carpet cleaning) professional. Call me now at (916)799-6482 in the Sacramento Valley or in the Placerville / Foothills area or simply fill out the quick and easy form below to request your FREE, No-Hassle In-Home (or office) Consultation and Price Quote. I will get back to you within 24 hours to schedule your appointment. if scheduled (not completed) within a week of initial estimate! 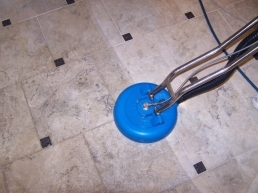 The grout cleaning, travertine cleaning and carpet cleaning pro's of Sierra Tile, Stone and Carpet Care are available in Cameron Park, Carmichael, Citrus Heights, Diamond Springs, El Dorado Hills, Elk Grove, Fair Oaks, Folsom, Granite Bay, Ione, Jackson, Lake Tahoe, Orangevale, Placerville, Rancho Cordova, Rancho Murieta, Rescue, Rocklin, Roseville, Sacramento, Shingle Springs, Wilton and surrounding areas. Home | About | Quote | CLICK to CALL NOW! Looking For a Carpet, Natural Stone or Tile Cleaner? Thank you for considering Sierra Tile, Stone and Carpet Care. A professional carpet, stone and tile cleaner is standing by to show you just how clean and beautiful your carpet, tile floors, counters or showers can be. Simply fill out the quick and easy form below to request your FREE, no-hassle in-home (or office) consultation and quote. Someone will get back to you within 24 hours to schedule your appointment. if scheduled within a week of initial estimate! Marc, I thank you for not only an excellent tile cleaning job but also for accommodating me in conjunction with interior painting and carpet installation.